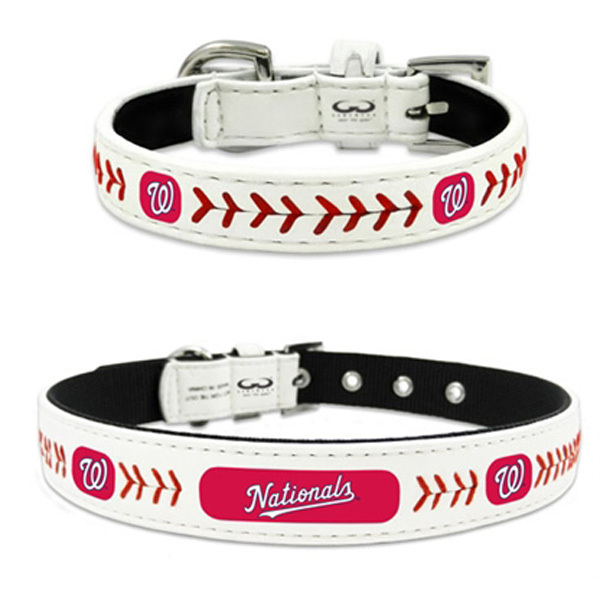 Get your favorite four-legged friend in the game with this officially licensed Washington Nationals Leather Dog Collar from GameWear®!! Each collar is handcrafted from baseball leather and thread, and emblazoned with your favorite team’s logo and colors. Made from soft leather for the ultimate in comfort, collars feature heavy-duty metal buckles with eyelets for maximum durability. Leashes (sold separately) have coordinating soft leather handles to match the Stitched Leather Collars and sturdy metal chains and snaphooks. Great prices. Great selection. Great quaity.